For the fifth time in six weeks, domestic stock indexes ended last week in positive territory. The S&P 500 gained 0.24%, the NASDAQ added 0.67%, and the Dow eked out a 0.06% increase. International equities in the MSCI EAFE grew by a sizable 1.99%. The Producer Price Index beat expectations and rose 0.3%. The Consumer Price Index beat expectations and rose 0.1%. Retail Sales met expectations and rose 0.1%. Housing Starts beat expectations to reach 1.29 million - including the highest measure for single-family home construction since 2007. In addition, the most recent data indicated that fewer people filed for unemployment benefits the week of March 11. We have now experienced 106 straight weeks of unemployment claims staying below 300,000 people, which is a healthy labor market indicator. 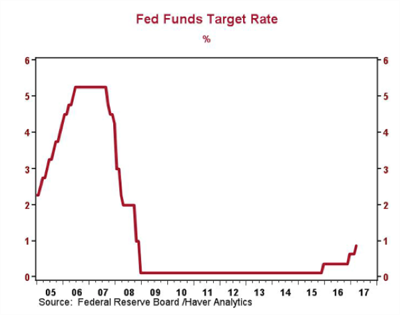 Given this information - and the wealth of economic data released recently - the markets expected the Federal Reserve's March 15 decision to raise benchmark interest rates. Last week's 0.25% increase is only the third jump since the Great Recession, and the pace of hikes is quickening. The Fed has now raised rates in December 2015, December 2016, and March 2017 and expects at least two more increases this year. Like with all economic data, understanding the context is critical. While interest rates are on the rise, they are still low, as you can see in the chart below. How will rising rates affect your financial life? Stocks rose following the Fed's announcement, with the S&P 500 gaining 0.84% on Wednesday. A strong economy is good for stocks; but anticipating exactly what lies ahead is impossible because so many outside forces impact equities. Right now, however, the markets are performing well and responding positively to increasing rates. Generally speaking, as interest rates rise, bond yields go up and their prices go down - with long-term bonds suffering the most. However, those are not hard-and-fast rules for how to move forward. Your specific needs and strategies will determine the best way to move forward with bonds in a rising interest rate environment. If you have revolving debt-credit cards, home equity line of credit, etc. - and your interest rates are variable, you will likely see a difference in your payments very soon. In fact, a 0.25% increase like we experienced last week may cost consumers an additional $1.6 billion in credit-card finance charges in 2017 alone. When revolving debt interest rates go up, banks may quickly adjust the interest rates they charge, but they often wait to increase the interest rates they pay. Right now, the average savings account pays 0.11% interest, but some institutions offer rates up to 1.25%. Finding opportunities to capture a larger return on your cash is possible. If you have questions about why the Fed is raising rates and how their choices may affect your life, we are always here to talk. Our goal is to give you the insight you need to feel informed and in control of your financial future.